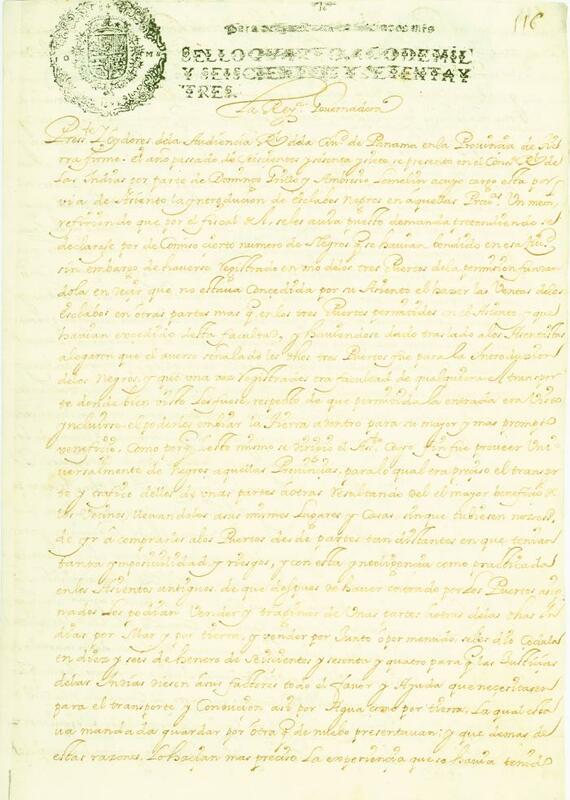 “To the Court of Panama that executes what was agreed in that year  to allow the factors of Domingo Grillo to introduce Black slaves inland.” A royal directive regarding the Asiento, signed in Madrid by Queen Mariana, July 3, 1673. The Asiento was a contractual agreement between Spain and individuals, businesses, or other nations to provide African slaves to the Spanish colonies in the Americas. The roots of the Asiento go back to the Treaty of Tordesillas, signed in 1494, which divided the Atlantic and gave Spain the Americas, while Portugal gained the right of trade in Africa. The Asiento system ran for over three centuries, from 1518 to 1834. In 1663, the Asiento was awarded to two Genoese businessmen, Domingo Grillo and Ambrosio Lomelin. Under the terms of the contract (effective 1668), Grillo and Lomelin were to introduce 24,500 African slaves to the Spanish colonies over a seven-year period. Each year, 3000 were to be sold as the traders saw fit, while 500 were to serve in the shipbuilding industry, and for this right the Spanish crown was to be paid the 100 pesos per African imported. Grillo and Lomelin did not send ships to Africa to acquire captives, but rather, they contracted with the English and Dutch to transfer slaves from Barbados, Jamaica, and Curaçao to designated Spanish colonial ports.